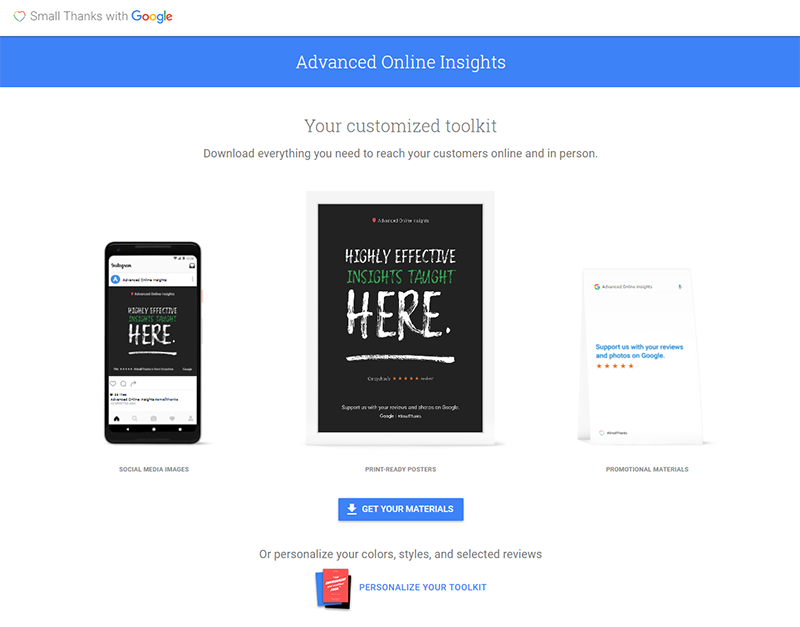 Small Thanks with Google is a website that Google created to allow business owners to take the reviews left on the their Google My Business Listing and turn them into full size posters or digital postcards to share in their business and online. 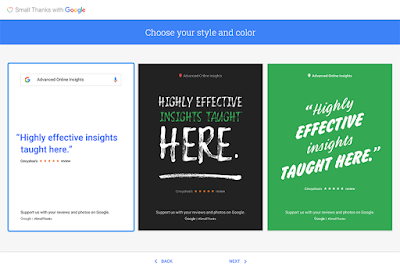 Take advantage of all of your customer's praises of your business with Small Thanks from Google. 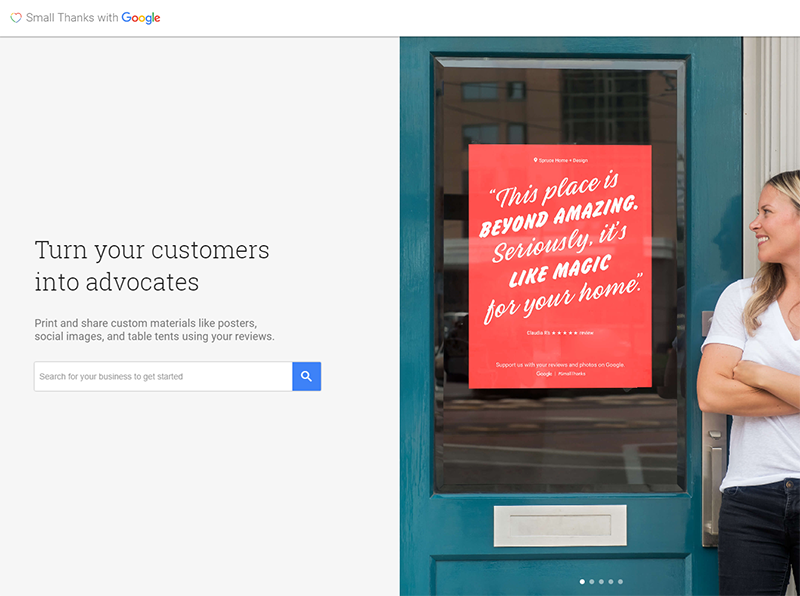 Simply go to smallthanks.withgoogle.com and type in your business name to get started. 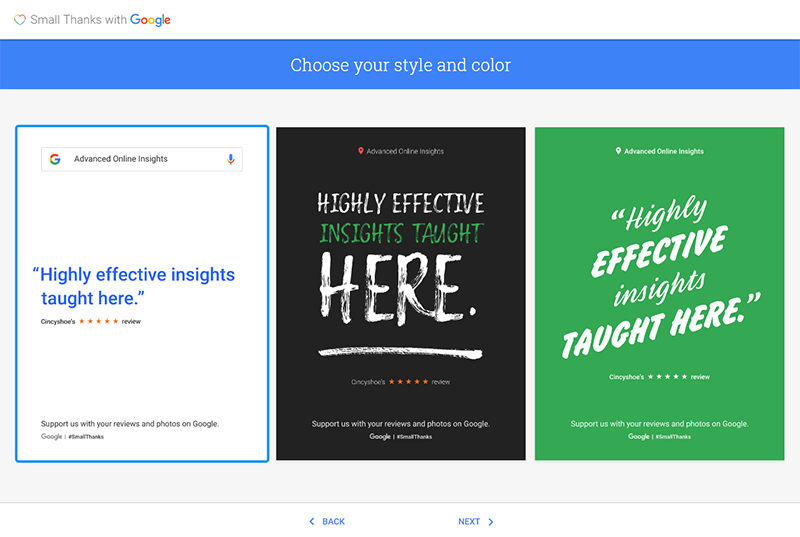 Google has created an easy to follow step-by-step process to allow you to quickly and easily create a fun professional poster to display in your business along with some great digital content. Choose the a layout and review/s that best represent your business. Choose your style and color. Click the "Via Download" button to download your posters and digital toolkit. Your digital toolkit is full of amazing pre-built posters and digital assets for you to use to promote your business. Scroll to the bottom of the page to see a breakdown of all of the files in the digital toolkit. Reader: "Okay Joe, I've been to Small Thanks with Google before and I love it but where is this next level you mentioned in the title of this article?" Joe: "Thanks for asking, and thanks for reading this far into the article. I promised next level, and I aim to deliver. Let's go!" 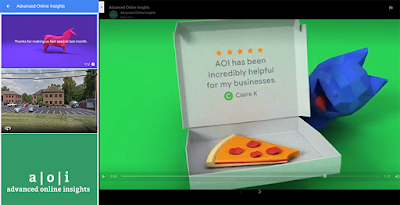 Google added a new feature to the Small Thanks with Google website in March of 2018; an auto-generated business highlights video to share with your customers. Hmmm.... "How could we possibly use this video to enhance our Google My Business Listing?" I'll answer this one for you. 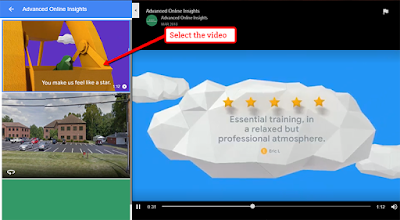 In February of 2018 Google added the "Add a Video" feature to the Google My Business program. I have been helping businesses add videos to their listings while trying to find a good solution that would work for business owners who do not have any video content already available to them. This is a perfect solution. 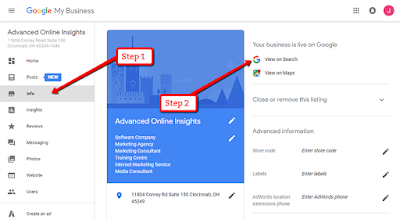 Follow the steps listed below to download and add a video to your Google My Business Listing. Go to smallthanks.withgoogle.com and type in your business name. Scroll down the page until you see the, "Your business highlights" video and click the link button. We need to download the video to be able to add the video file to your Google My Business Dashboard. I recommend using a website like y2mate.com to download a video from your internet browser. Go to y2mate.com and paste the link into the dialog box and press the "Start" button. 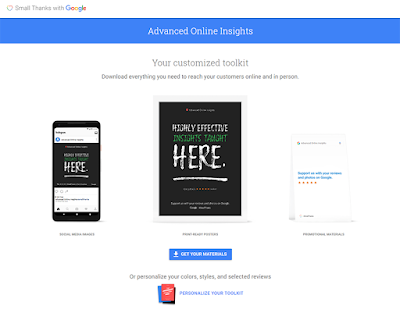 Go to google.com/business and log into your Google My Business Dashboard. Select the Photos section and click the "add a photo or video" button. It's a blue circular button with a "+" in the middle. Click the "Select photos and videos from your computer button and choose the video file you downloaded in Step 5. 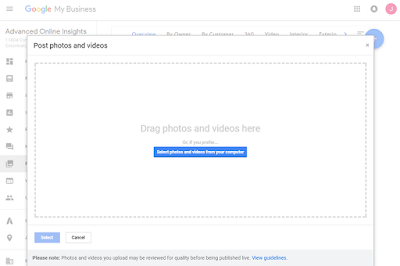 Google will process the video file and add it to your Google My Business Listing. Once it is finished go to Google Search and type in your business name to see your listing. Click on the image gallery to check out how awesome your listing looks with your video playing in the gallery. Yeah, that's right, I know your mind has already been blown, but take a deep breath and let's get every ounce of value out of our great new video. Listed below are even more ways to share your video. 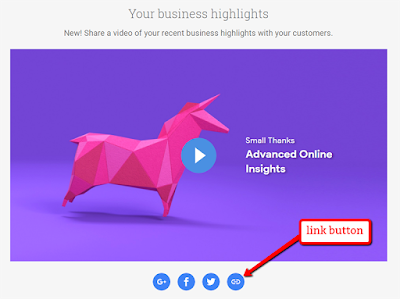 Create the best link to share your business highlights video. 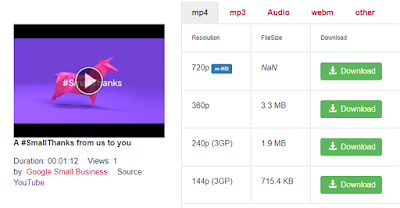 It would be easy to just use the links on the Small Thanks with Google page to share your video but that would not get the absolute most value out of it. 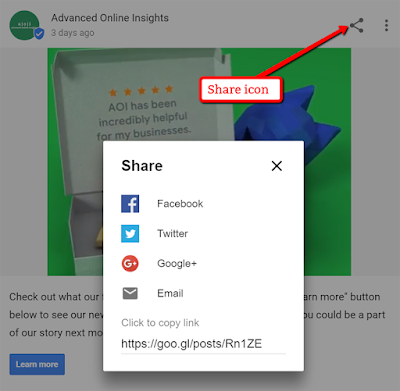 Using the Facebook, Twitter, and Google+ link will easily share your video on those platforms and your followers will be able to see your content, but the link itself will only access the YouTube page where your was video generated. 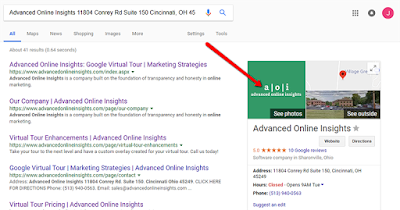 A much better approach is to use the link to the video that was created when you added it to your Google Business Listing. 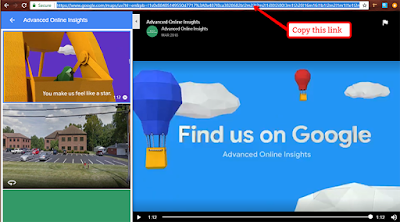 This link will not only allow you to show off your video but every click on it will be directed to your Google Business Listing and will trigger the Google search algorithm to see that your business is popular. This adds SEO to your Google Business Listing and linking this way gives the user all of your business information at their fingertips. Follow the steps below to create the best link to share for your video. Log into your Google My Business Dashboard and select the "Info" tab on the left. Next click the "View on Search" link on the top right of the screen. This will open Google Search with the business listing displayed on the right hand side of the screen. Click the main image of the listing labeled, "See photos". This opens the listing to the image gallery. Scroll through the image gallery and select your business highlights video. The video should begin to autoplay on the right side of the window. Select the url at the top of the screen and copy it to your clipboard. This is the best link to share your video across all of your social network platforms. 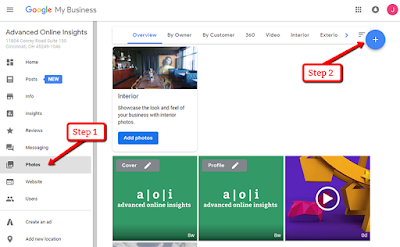 Create a Post on your Google My Business Page and add your new video link to the "Learn More" button. Once you have submitted your post and it is live, search for your business on Google. Click the post to view it, and click the share icon in the top right hand corner of the post. This is the best way to link to your new content and will not only show your video in the best light it will increase your views on your Google Business Listing. Printing your Small Thanks Posters and proudly displaying them on your walls can actually increase your online presence. 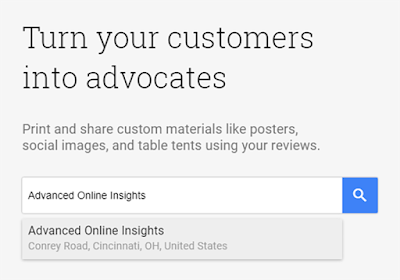 People visiting your business will see how much your customers appreciate you and the poster also lets them know that they can tell others about their experience online as well. We find that businesses who display their reviews in their store generate more reviews online simply because customers know that the option is available to them. 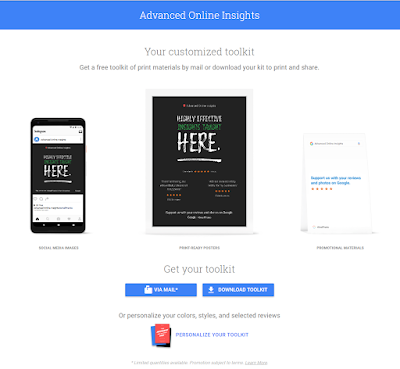 The toolkit you downloaded from Small Thanks with Google contains much more than just a poster you can print for your business. I have listed the files in the zip file and their descriptions below. The main file folder contains 2 sub-folders and 2 documents. Print-Ready PDFs folder - contains the printable review posters for your business along with several other printable files including postcards, stickers, window clings, and a table tent. Social Media Images folder - contains optimized images of your review posters to share on the web. Tips Sheet document - overview of the files in the toolkit and printing instructions. Welcome Letter document - a letter of encouragement and advice from Soo Young Kim, Head of US Small Business Marketing at Google. explain the reasons why I chose to approach each step the way that I have to benefit the absolute highest level of value you can achieve with the fewest amount of steps to follow. If you have any questions at all feel free to reach out to me anytime. If you are a business owner and find these concepts valuable but do not have the technical skill or time to update your listing yourself, please email me and I would be happy to introduce you to a local marketing firm that has gone through our training certification courses and can manage your Google My Business Listing for you.